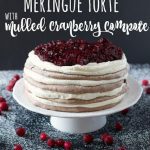 This Meringue pavlova torte is a delicious and impressive holiday dessert, made with layers of chocolate spiced meringue, whipped cream, and mulled cranberry compote. Preheat your oven to 275 degrees Fahrenheit. Prepare two baking sheets by lining them with parchment paper, tracing two 7.5 or 8-inch circles on the underside of each piece of parchment (you'll have 4 circles in total, two on each baking sheet). It's best to use a dark marker on the underside of the parchment so that when you flip it over, the circles are visible through the parchment but the marker won't transfer onto the meringue. Add the egg whites to the bowl of your stand mixer fitted with the whisk attachment. Whip the egg whites on high speed just until foamy. Slow the mixer to low speed and begin adding the sugar in a constant slow stream until you've added all 1 1/3 cups of it. Increase the speed of the mixer to high again and let the egg whites and sugar whip until they reach stiff peaks (about 5 minutes). This means that when you stop the mixer and remove the whisk attachment from the mixture, the egg whites stick up and form a peak that doesn't fall to the side. Once the egg white and sugar mixture appears to have reached the 'stiff peak' stage, remove a very small amount of the mixture from the bowl using a small, clean spoon and rub the mixture between your fingers. If it feels smooth and you can't feel any sugar granules then this means it's time to add the rest of the ingredients. Another way to test this is to taste a little bit of the mixture to make sure the sugar is completely dissolved. Once the mixture has formed stiff peaks and the sugar is dissolved, sift the cocoa powder, cinnamon, cloves, cornstarch and cayenne pepper through a sieve into a small bowl to remove any lumps and to combine the dry ingredients. Turn the mixer to medium-high speed and add the dry ingredients to the egg white mixture very slowly. Turn the mixer off and VERY carefully fold any stray dry ingredients into the meringue mixture. Divide the meringue mixture between the 4 parchment circles on the baking sheets and smooth the mixture out to the edges of each circle using an offset spatula. Make sure the meringue mixture is spread out as evenly as possible, since you'll be stacking the meringues on top of each other to create a torte that's as level as possible. When you assemble the torte you'll be adding cream between the meringue layers so they don't have to be perfectly even, just try your best. Because of how the meringue bakes there will be some slight variations in each layer that will create a rustic look when the torte is finished. Add the baking sheets to your oven preheated to 275 degrees Fahrenheit. If your oven won't accommodate 2 baking sheets on one rack, use 2 oven racks as close to the centre of the oven as possible, making sure that the meringues on the bottom rack have room to rise a little bit. Bake the meringue layers for 50-55 minutes at 275 degrees Fahrenheit, rotating the baking sheets after 30 minutes if you have the pans on two racks. Remove the meringues from the oven and let them cool completely on the baking sheets. If they crack a little bit around the edges it's to be expected, and leaving them to cool completely before moving them will stabilize the cracked areas if there are any. While the meringues are cooling, prepare the cranberry compote by adding the cranberries, brown sugar, and spices to a pot over medium high heat. As the mixture comes to a boil, turn the heat to medium and stir often until the cranberries break apart and the mixture becomes thick. Remove it from the heat and transfer it into a bowl to cool completely. If you're using real whipped cream, add the whipping cream and sugar to a bowl and whip on high speed just until firm peaks form. When the meringue layers and the cranberry compote have cooled, assemble your meringue pavlova torte by spreading the whipped cream (or whipped topping if you prefer) between the meringue layers, leaving some for the top. Carefully spoon the cranberry mixture over the whipped cream on top of the last meringue layer and dust the whole torte with a thin layer of powdered sugar. Watch the meringues carefully toward the end of the baking time, making sure they don't begin to brown. It's a really good idea to use an oven thermometer when you're baking delicate desserts like this because if your oven temperature is off it can prevent you from achieving the result you're hoping for.